The website builder enjoys popularity with designers, artists, illustrators, photographers, models, architects and other representatives of creative professions. An integrated online store allows selling physical and digital products: photos, videos, pictures, handmade items, music etc. You can launch and manage an effective blog to support this activity. Format is positioned as a progressive portfolio website builder with a visual editor. It will work well for those, who need to present photos in the format of a website to advertise products, skills or services. But is it really worth the investment? Do you have to use this very platform or it is better to look for the alternatives? Is its functionality really decent? Let’s answer these and other questions in our review. Format uses the same mechanisms of dashboard interaction with interface as other website builders with a visual editor. It’s not quite difficult to use, but you cannot call it too simple as well. There are many settings and options here. It’s difficult to get used to them and memorize their positions because of their amount. This is another side of decent functionality. Interface ergonomics is nice, the dashboard elements are positioned logically and they come with understandable titles. There is also a quality well-designed customer support section. The website builder will work for newbies, but get ready to spend a couple of days in the dashboard for its more effective use – Format has more settings than the majority of other similar website builders. You’ll have to look for some dashboard elements at first. For those users, who have the experience of working with similar products, Format will seem simple, but not primitive at all. It is obvious that the focus is made on the detalization of options, but not on the global simplification of all the elements. However, the interface is pretty user-friendly, although, you cannot call it appealing – it is standard, smooth and detailed. 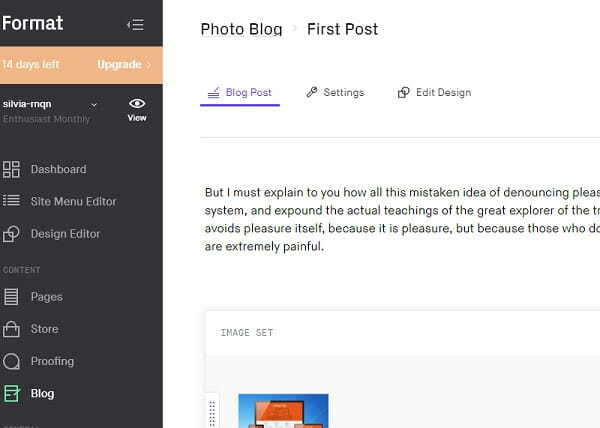 Its design and structure resemble WordPress, which will come up to the needs of the prevailing part of the system’s audience. Format makes it possible to create modern portfolios with versatile structure and responsive design. Everything is tailored to the effective presentation of graphic material – photos, illustrations, pictures etc. Integration with social networks (especially Instagram) matters a lot. Video galleries are supported as well. Any of them can be protected by the password and water signs. 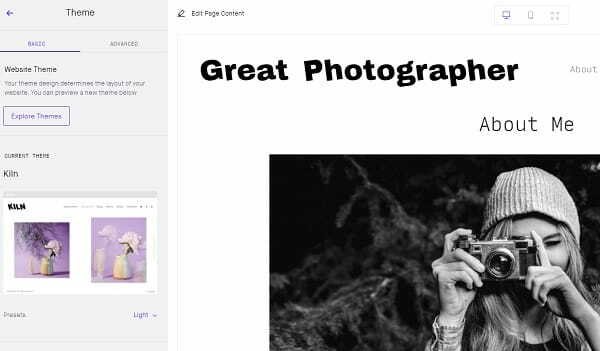 An opportunity to download/install Format Publisher or Adobe Lightroom plugin for quick publication of photos from the editor hints on the main elements of any website created within the system – that is, the image. You can also upload photos to the galleries directly from your mobile iPhone app. Integrated blogging engine will let you tell the stories about yourself and your creativity to the broad audience. It is simple and convenient to use. You can enhance the portfolio with a web store to sell any images, videos or, let’s say, T-shirts with prints, cups, handmade clothes or something else. The dashboard structure is designed in the form of the sidebar with the sections of settings and working area to provide the changes of each functional part. Many sections come with links to the neighboring settings. This is convenient, even though, this is somewhat scary and impairs the systematic memorization of positions and types of elements. Collection – the combination of galleries and pages with similar specialization into a single unit. This will be enhanced by the animation with slow transitions. For example, you can make a collection of photos from different Australian cities or photos of one model taken in different locations. Format supports the sales of different types of products (physical, digital or service products). Just like any other web store, it has currency, shipping, payment, stock items, product availability and SEO settings. PayPal is used to accept online payments. You can set up notifications for customers with different scenarios and acceptance of messages about the purchases. There is also an integrated blog tailored for photo and video presentation. You can also add standard text, although, posts published in Format look similar to those found in magazines rather than in newspapers. It has strong focus on multimedia stories. This is organized differently than in other systems. By the way, each blog and web store page can be designed individually. Format pays much attention to private content. It is possible to create projects for cooperation with certain clients in the Proofing section. These sections will be hidden from those users, who don’t have access to them. Thus, you can store galleries, web store show windows for certain groups or even separate clients in your portfolio. This is a convenient working process. You can also set passwords to web pages, hide them from the menu, apply water signs on photos and videos. 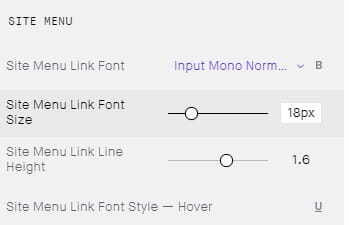 By the way, submenus are supported as well. SEO work is also conveniently organized – you will be able to fill out meta tags for all website pages on one screen only. There is an opportunity to connect Google Analytics, add favicon, your own domain and other standard things here. Generally, Format functionality encompasses everything you might need to design a commercial portfolio. There is an opportunity to individually design each gallery, combine them, protect with passwords, create private website sections, accept online payments for various types of products, manage a blog and share this content in the social networks. The only note is that the interface design could be more attractive as the system is meant for creative people. All Format themes are based on versatile visual gallery presentation. 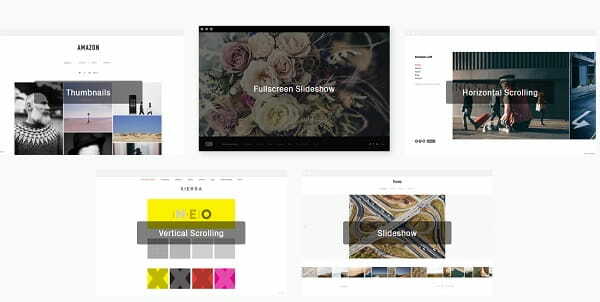 They are subdivided into 5 types, namely fullscreen, slideshow, tiles, vertical, horizontal. Each category includes several variations of the chosen layout presentation. All in all, there are 25 different themes here, which are oriented on attractive image presentation. All the templates are responsive, which means that they correctly display content on desktop and mobile screens. Each theme is offered in several color schemes – light, bright, dark etc. Although, you can manually set up the color scheme of the website in details. A pleasant bonus is an opportunity to adjust the template and design of each page separately. In other words, you will be able to differently design web pages, for example, various photo categories: still lives in one style and portraits in another style, visually highlighting the difference between them. You can have a look at the full-screen design preview. The quality is on a decent level. It doesn’t impress you by unbelievable solutions, but it completely comes up to the expectations from the niche portfolio website builder. It’s difficult to add something to the visual set of templates – Format offers out-of-the-box display options for all the existing formats of image presentation. 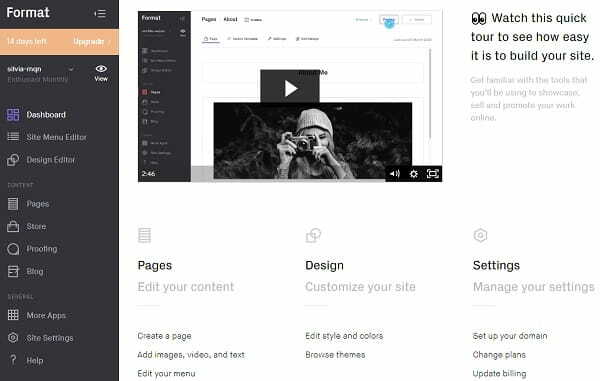 You can set up website menu (position and height), gallery pages (navigation, full-screen image display, transition animations and their speed, thumbnails), fonts and colours of almost all website elements. It is possible to choose cover image layout/size/spacing, link position and text alignment for collection pages. You will be able to view the result in the standard and mobile website formats, while working on its development. Generally, this is just a small part of Format design settings. If you wish, you can adjust the size, design, social network icons color, format of links, titles and standard text, colour of each website element, size etc. Detalization is so extensive that there is a risk of getting lost in possible modifications and get a mediocre design in the result. This is not to mention the benefits manual code editing unveils. 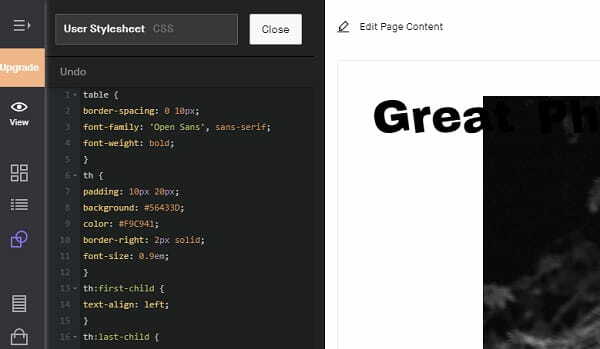 When it comes to adjusting portfolio style and structure, Format is definitely a powerful solution. Format tech support is distributed between several countries from different parts of the world, which makes it possible to ensure 24/7 customer support. You can communicate with them via email or the live chat window. Managers are user-friendly. They respond quickly and professionally. The Help Center is well-structured and has various sections with detailed description of each action you should make in the system. There is also keyword search here. Unlimited, $25/mo – unlimited images, unlimited store products, unlimited pages and blog posts, unlimited proofing images, free domain and premium themes, custom code editing. Monthly fees will be 30% higher. The payment is accepted via MasterCard, PayPal and Visa. The system has 30-day money back guarantee, starting from the payment day. Generally, Format cost can be compared to other niche website builders. It is impossible to call it expensive or cheap. This service should be chosen not by the cost criterion, but with regard to your needs. Template customization is powerful, but it’s not quite understandable – it’s sometimes difficult to understand the changes you make as excessive detalization can be a bit confusing for newbies. Generally, Format is a great niche product. It is comparatively simple in use and it doesn’t have obvious functionality drawbacks. Instead, it comes with extensive user community and perspectives. Format is a quality service used to create any portfolios. It will be useful for artists, photographers, representatives of modeling business, architects, designers as well as for everyone, who needs to present something through image galleries. The website builder cannot be called the best in the niche as there are many decent competitors, who can complete the same task for the same cost or even cheaper. Is Format worth using? Yes, it is, if it appeals to you after you explore it on your own. You are likely to be satisfied with its quality, if you like its interface. The functionality of the service won’t let you down.